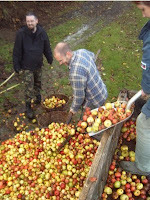 How to make cider: Part 2. The apples we helped pick at the end of October had been left exposed to the elements to "mature", precisely why, I’m not quite sure. 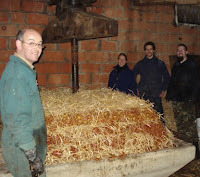 Apple-pressing time was now upon us and, our (then) volunteer David joined us at Paul's and Christiane’s farm. 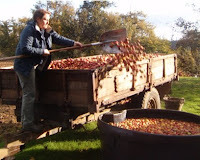 We supplied a 1000 litre animal drinker, which proved ideal for industrial-scale washing of apples and Paul had welded a basket of mesh to an old hayfork to create the perfect utensil for scooping out the apples from their cold bath and loading up wicker baskets. 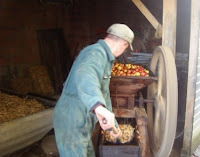 The apples were then crushed and shredded by an ancient machine, originally bought by Paul’s grandfather in 1910. It was belt driven by an electric motor. Pause for a technical scratch of my head: by way of comparison, I have a bicycle and the chain turns around two sets of toothed cogs; even so, occasionally the chain comes off. 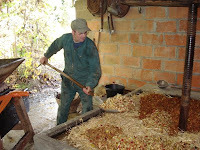 The apple crusher is turned by a very worn flat fabric belt, about three inches (75mm) wide, with plenty of defects and scraps hanging off and runs on a decidedly warped wooden wheel. It’s tensioned by a broomstick wedged between the itself and the motor; accurate alignment is effected by kicking the motor around until it looks in line with the wonky wheel. It didn’t miss a beat all afternoon, how does that work, then? 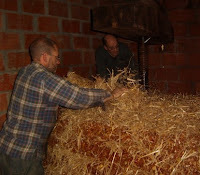 The chunky pulp was collected in a leaky wooden trough, from where Paul scooped it up with a shovel, the sides “adjusted” (with a hammer) to be a tight fit, so’s not to miss a scrap. 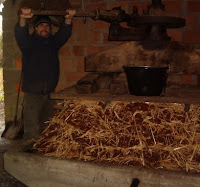 He slapped this stodge onto a bed of straw and so built up a cake of layers of apple pulp and straw in the traditional cider press (also bought by his dad in 1910). 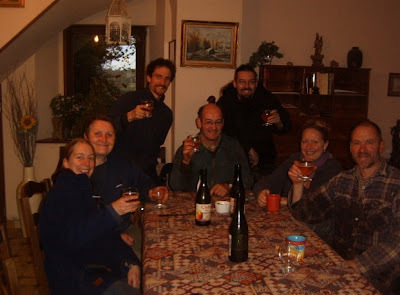 Once we were underway, Emma and Pete, holidaymakers staying in our gite for an autumnal week, cycled up to see what was happening. Two blinks of an eye and they were both mucking in. 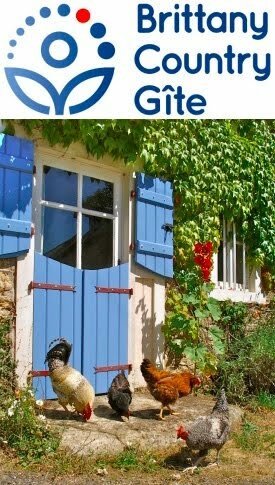 It was fun to see because, for them, they were having a really authentic, bucolic holiday bonus and for free but Paul couldn’t get over that they were vacanciers (holidaymakers) but were willing to get dirty and cold whilst offering help. (Photo shows l-r Paul, Emma, David and Pete.) He was so astonished, he remarked on it several times. 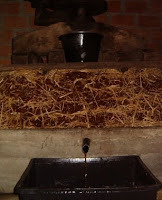 When the last apple had gone to apple heaven, we were all invited into the farmhouse for cider (bought at the local agricultural college) and cake (see photo at top). 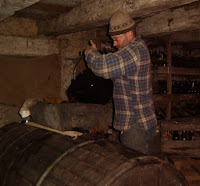 Quote from wikipedia: "Because flat belts tend to slip towards the higher side of the pulley, pulleys were made with a slightly convex face (rather than flat) to keep the belts centered"
Excellent use of the word bucolic implying as it does a traditional rural activity pursued in a haze of alcohol. By the way there is nothing wrong with being wonky. Wait till you get to 60 and you'll discover wonky is the only way to work.